Most products on the market today contain a variety of toxic substances that can completely devastate your health. According to the Environmental Working Group (EWG), household cleaners and personal care products lack safety regulations. As a result, manufacturers aren’t required to publish test data or notify consumers if their product contains harmful substances. And these harmful substances shouldn’t be taken lightly. They can destroy your body in a number of ways by causing cancer, disrupting your hormones, damaging your brain, and much more. Search for all the products you use at the EWG site or the EWG app. They have an amazing database that can tell you if your beauty or cleaning products are safe. Read the labels. If a cleaning product is labeled “hazardous to humans” or “toxic to animals,” it’s best to avoid use. Stick to brands that are well-known for producing safe products. These steps are a great way to get started. But to truly protect yourself, you need to be aware of the most common household threats. Detoxifying the home is as important as selecting healthy organic foods to protect and maintain your health. To detox your home, start by taking a good look at the cleaning solutions, powders, and pastes under the sink. Replace these toxic substances with alternative safe and natural cleaners. When in doubt, look to EWG to determine if a product is safe. Be careful though, some products which claim to be safe are anything but safe—so EWG is your best bet. A large percentage of household cleaning products contain synthetic fragrances— including dish soaps, liquid hand washes, air fresheners, and paper products. The problem is companies aren’t required to inform consumers about the ingredients in their fragrances. If you see “fragrance” on a product label, it’s likely that the product contains a class of dangerous chemicals called phthalates. Researchers have found that phthalate compounds can disrupt hormones (endocrine system), damage the reproductive system, and even cause cancer in humans and animals. Most phthalate compounds are inhaled but it’s also possible for the skin to absorb them (e.g. using scented soap or shampoo). Our skin has no protective safeguards from toxins and phthalates can easily pass through it. Once absorbed through the skin, phthalates can pass directly to the body’s internal organs through the bloodstream. 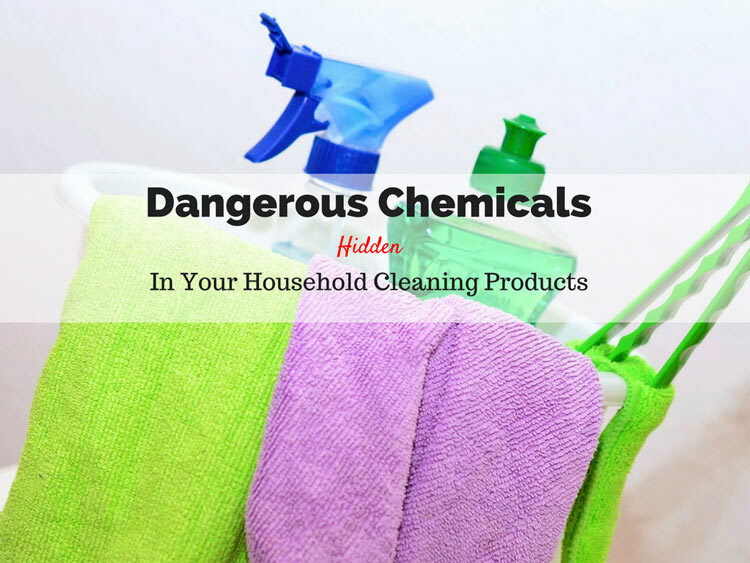 And phthalates aren’t the only harmful chemicals found in standard cleaning products. The point here is to stress the importance of using safe cleaning products. Also, don’t overlook household fragrances such as plugins or sprays. They are just as bad. There’s plenty of healthy alternative ways to scent your home. One of the most popular ways, by far, is to use essential oil diffusers. Spot removers, carpet and/or upholstery cleaners, and many dry-cleaning products contain perchloroethylene, or PERC. According to environmental protection scientists, PERC is a neurotoxin and a likely carcinogen. In fact, individuals who live in apartments located over dry cleaning businesses frequently report coordination loss, dizziness, and other troubling symptoms. But how can you avoid PERC? If home décor items, like drapes, or clothing bear the label “Dry Clean Only,” search for a wet cleaner. These cleaning providers use water-based solutions instead of chemical products containing PERC. You can also try nontoxic alternatives at the natural foods store or apply liquid castile soap to stains before a gentle hand-washing. If you must use a dry cleaner, be sure to ask them about the products they use. Triclosan is one of the most prevalent antibacterial substances found in products. And due to its widespread use, it’s contamination can be seen everywhere. According to the Centers for Disease Control and Prevention, triclosan is found in municipal water supplies, human blood plasma, and newborn babies’ umbilical cord blood. It’s found in many antibacterial dish & hand soaps and it’s used by several consumer pharmaceutical companies’ personal care products. Recently, the FDA reported that antimicrobials like triclosan don’t improve human health or prevent illness. The overuse of chemicals like triclosan can even make bacteria resistant to other antibiotics needed to combat dangerous microbes. Case and point: to keep you and your home healthy, avoid products with triclosan. Ideally it’s best to avoid antibacterial soaps and sanitizers altogether. Although this may not be possible for those of you who work in a medical facility. QUATS, or quaternary ammonium compound substances, are frequently found in fabric softener products (liquids or sheets) and some “antibacterial” cleaning products. To protect your household, don’t use traditional liquid fabric softeners or sheets. Vinegar is nontoxic, removes residues from soaps in the rinse, and prevents static in the dryer. Just be sure to opt for white vinegar because apple cider or other vinegars may stain cloth. To disinfect bedding or other items, add natural organic tea tree oil. You can also add lavender essential oil to the rinse cycle leaves wash smelling fresh. Many cleaning or polishing agents used for bathroom, glass, or jewelry contain ammonia. It’s commonly found in many commercial window cleaning agents because it evaporates and doesn’t streak. The EPA says ammonia can negatively affect people who have asthma or others with breathing issues or lung problems. Also, people who use ammonia often are more prone to develop asthma or chronic bronchitis. Instead of using products that contain ammonia, try vodka. Surprisingly, vodka has the same cleaning and shining power on metals, mirrors, and ceramic surfaces. Chlorine bleach has been an American cleaning staple for years. It’s used in toilet cleaning, laundry whitening, or mildew/mold removing agents. Even if you don’t use chlorine at home, it’s possible to come into contact with chlorine in the municipal water supply or swimming pools. Over time, chlorine can irritate the respiratory tract, destroy the delicate balance of your gut bacteria, or disrupt thyroid function. wash/whiten clothes with white vinegar and/or borax powder. You can also find chlorine-free bleach powders at the natural food store. I would also highly suggest that you install a chlorine filter on both your kitchen and bathroom sinks to avoid chlorine exposure from water. Standard oven cleaners contain sodium hydroxide (also called lye) which can be dangerous to your health. Sodium hydroxide can cause severe burns from contact exposure—this can be really bad if it comes into contact with your eyes. Also, breathing in lye can cause a long-lasting sore throat. Instead of lye, try cleaning the oven with a paste made from baking soda. It’s equally as effective and much safer. Sally Wong is a natural health and green living author. She knows that eating healthy organic foods, drinking clean water, and getting enough exercise are just part of a healthy lifestyle. Keeping a healthy home goes hand-in-hand with the decision to live a healthy lifestyle. She has a personal blog about the health benefits of essential oils.